The Jam Strap is designed to improve the feel of any skate. If you do not have them already, you should get some ASAP! Jam straps are the Original and best skate support available. The size standard fits most skates, if you have Large or very wide skates you should go for the X-wide. This is a 'must have' product for Roller Derby. Once you get used to them, you will wonder how you skated without them. I’ve recently been given the opportunity to be a Skate Britain brand rep. As part of this they’ve been sending me through different skating equipment to review, the first of which is a pair of Jam Straps. They’ve been causing a bit of a stir recently so you might have seen them pop up on your feed on Facebook or Twitter, so the review seems quite timely. So what is a Jam Strap? 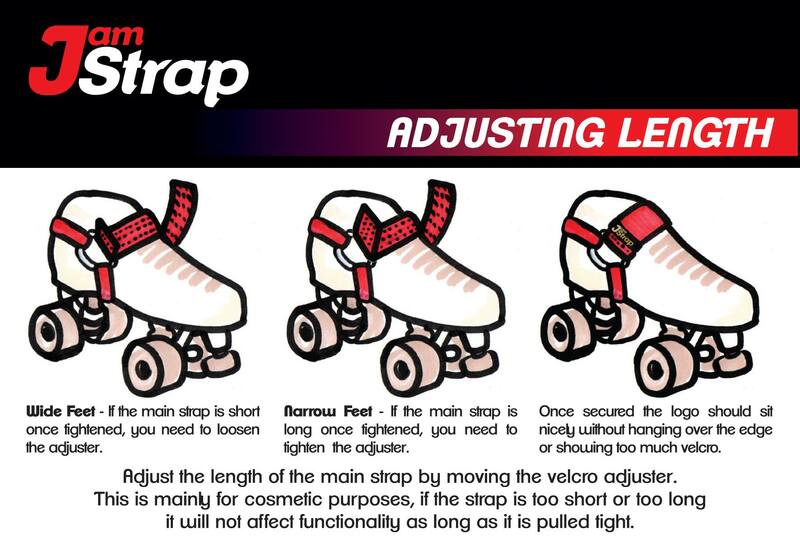 They are a really simple, Velcro-secured (like everything in roller derby) strap that goes around the exterior of your skates. Why would you want that? Well my initial assumption was that they were for people whose skates didn’t fit that well, to hold your heel in place. They do that pretty well, but their talents don’t finish there. 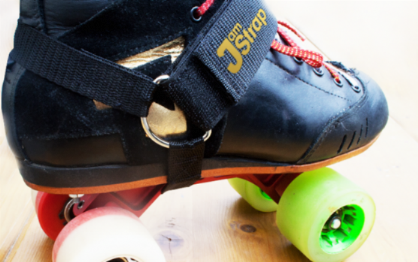 If your skates fit you perfectly, you may still want a set… I’ve recently upgraded my skates and thought I would struggle to have anything constructive to say about the Jam Straps. After all, my new skates are heat molded to my feet making them the fanciest and best fitting feet coverings I have ever had. The first time I put on the jam straps I took my time, putting the loop strap under my plates and positioning it across my heel carefully. I played about with how tightly I pulled the Velcro across the top of my foot, finding the balance between ‘too loose to be useful’ and ‘so tight my feet tingle’. Then I got up to skate… Nothing life-changing happened and I took them off and offered them out to my teammates to try them instead. I had decided they must only work if your skates don’t fit. I realised over the next hour, that what I had done was have a little strop, throwing my Jam Straps out of the pram because they didn’t instantly change my life. I’m new to reviewing things, so let’s chalk that up to inexperience. I committed to wearing the Jam Straps for the next week or so of training, scrimming, skate parks and bouting. If there was anything to be noticed, then I would at some point during all of that wheel-based fun. After around 6 hours of skating I decided to do a training session without the Jam Straps. As soon as my skates were laced and I was standing I noticed the difference. I was shocked that my perfectly fitting (yes I’m in love with them) skates felt noticeably different. There is a snug and sturdy feeling you get from wearing the jam straps and without them I felt a bit flighty and loose. I felt less planted in my boot and I guess my plate, which makes perfect sense as I had been strapping myself down on to them. Bouting in my Jam Straps Bouting in my Jam Straps So how does it work? Well the two thinner straps in a loop hook under your back wheel across the plate up and around your heel. Where it sits on your heel seems to be personal preference, but I liked to have mine at the top where heel begins to curve back in. The thicker strap goes over the top of your boot, looping through the metal hoop and secures back on itself. To me this feels like your heel is being held into the back of your boot – hence why it works wonders for people with a bit too much room in there. It also holds your foot on the sole, planting it securely over your plate, which makes for a more responsive skate. If you think the bottom of your boot is designed to be solid, so that discreet movements can be passed through to your plates rather than being lost to a more flexible material; then the Jam Straps hold your foot onto the sole to enhance that even further. This is what I hadn’t instantly noticed, but after a few hours noticed the absence of when I removed them. If your boots fit perfectly, then this is why you want a pair of Jam Straps. Like I mentioned earlier, I did lend them out to other Bristol Roller Derby skaters who had issues with the fit of their skates and all of them said the Jam Straps noticeably improved this. By holding the heel in place, there was no more sliding around and discomfort. The only issue that was noted by one skater, is that if you have exceptionally high arches then you might struggle to find the balance between ‘too loose to be helpful’ and ‘ouch it’s crushing my arches’. The best scenario I can imagine this being used for is if you are skating on something like a pair of Riedell R3’s and can’t afford to take the leap up to the next level. 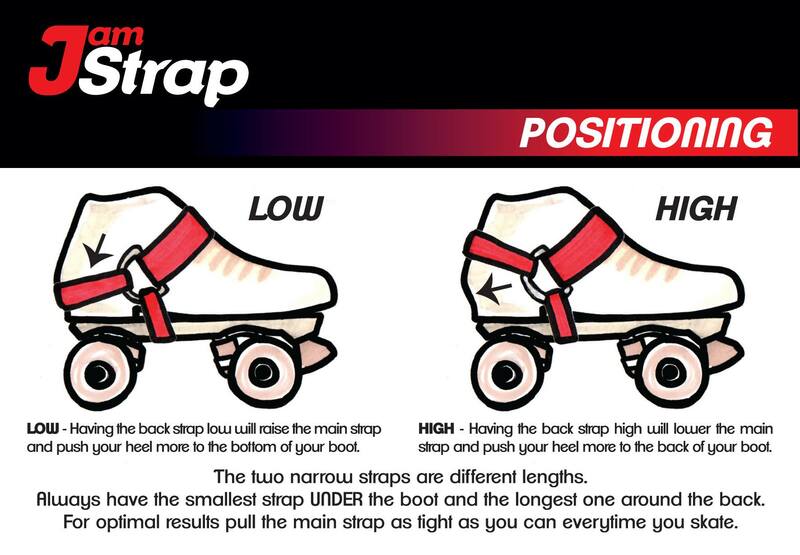 A pair of Jam Straps could improve the responsiveness of your skates while you save up for a new set of plates. IMG_0432 So to summerise… If your skates fit like a dream – get some Jam Straps to feel amazingly snug and planted on your plate If your skates are a bit loose – get some Jam Straps to give your feet a break and feel locked in place If you want to pick up a set then head over to Skate Britain now and give your feet a treat! Oh, jam straps... how do I love thee? Let me count the ways. These straps are seriously amazing for roller derby! I got a pair of pricey new Bont boots (which are known for having some heel slip issues), and thought it would be fine. But the heel slip was so bad I felt like I was flopping around in my skates all the time and had no control. At first I had some issues with my toes going numb, but as soon as I got inserts with proper arch support I could cinch down the straps all the way with no problems.I place the back strap high on the heel of the boot, and it totally fixes the heel slip problem. It also allows me to keep my laces fairly loose in the front to allow some toe wiggle, without causing any increased slipping. Even after several minutes of drills where we're up on our toe stops the whole time, my feet don't slip forward in the boots. I also find that I have increased control of my plates, since my foot is sucked down onto the plate nicely. I love these straps! I'll never skate without them. I've been recommending them to all my leaguemates. Best gear money I've spent.